Sheffield United have signed young Arsenal defender Kyle Bartley on a three-month loan deal to help ease their defensive concerns. The 18-year-old will provide cover for the injured Chris Morgan and Marcel Seip at the heart of the defence. 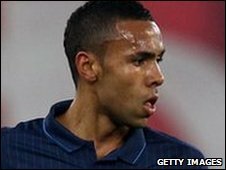 Bartley made his professional debut for Arsenal against Olympiakos in the Champions League in December 2009. The Gunners reserve-team captain could make his Blades debut against Preston North End on Tuesday.